Even though it was cloudy, I can still see some stars! Nice. My concern about this spot for nightscape photography was the potential for a lot of ambient light. That is indeed the case; the building is really lit up. Even the trees in the foreground are brightly lit. I'm interested in the technical details. What focal length lens did you use? Aperture? Shutter Speed? ISO? Camera? This photo was actually pretty overexposed. I have a Canon Rebel T3 with the standard kit lens. I used F5.6, 18 mm, 6400 iso and 30 seconds. The T3 is a crop sensor and as far as I can tell there is no way to lock up the mirror. I'm sure someone could do a nice job on a clear night with a full frame sensor. I've never tried to stack images, but it should be easy enough to eliminate the external lights and extra ambiant light. Her is one from the back of my parents home. You can nearly make out the milky way. 18mm, F4, 22 secs, 3200 ISO . It was a clear night but windy. The T3 doesn't have the mirror lockup feature but it does have live view. It has the same effect. The mirror locks up so the live view works. If you will be shooting a large number of shots, creating star trails, for example, just plug your video cable into the camera's video output slot. The camera will think it is tethered to a computer and it won't show anything on the LCD screen on your camera. This little trick will save a lot of battery life. An 18mm lens with a 1.6 crop camera is at the end of the focal length limits. It is equivalent to a 28mm on a full frame camera. You need a very wide angle lens to capture as much of the sky as possible. I usually use a 21mm lens on my full frame camera. Sometimes I go down to a 14mm lens. Couple new pics of my own and a question. What apps or websites do you use for tracking/predicting clear sky in Vermont? Nice Milky Way shots! Where did you make these photos. While there is a lot of light pollution in the foreground, the Milky Way looks good. I use two apps to track the sky. One is Cloud Map. It displays a satellite image of the visible cloud cover from a number of weather stations. It is really good for daytime sky. I also use the Weather Underground App. It has an infrared satellite image so it displays cloud cover day and night. I was in Utah in May and when clouds came up as we were shooting. We watched the infrared image and could see a clearing making its way toward us. We waited two hours but the clear sky finally showed up and we got our photos. I use Sky Guide to see a map of the night sky so I know what I am seeing. I also use Photo Pills, especially its Augmented Reality function to see where the Milky Way will be in relation to foreground I want to shoot. It is a great program. The light pollution is from Okeechobee and Lake Placid. They are both about 25-30 miles South of this photo. No hills or mountains in Florida, maybe a tree line would have helped to block some of it. I don't have a smart phone, but I can see where those apps would be really useful. Can you get Aurora Borealis notifications too? I've hear you can get a few hours notice. I've seen posts and videos on photopills, pretty impressive and accurate to within a few feet. Those are some wonderful Milky Way photos! We are visiting vermont this weekend and staying in waterbury, we would like to know if it is best time for milky way photo ops? We would be doing it first time so please suggest best places and also any tips and idea? This weekend the moon sets in the late afternoon so you will have moonless skies for your shoot. That is a good thing. 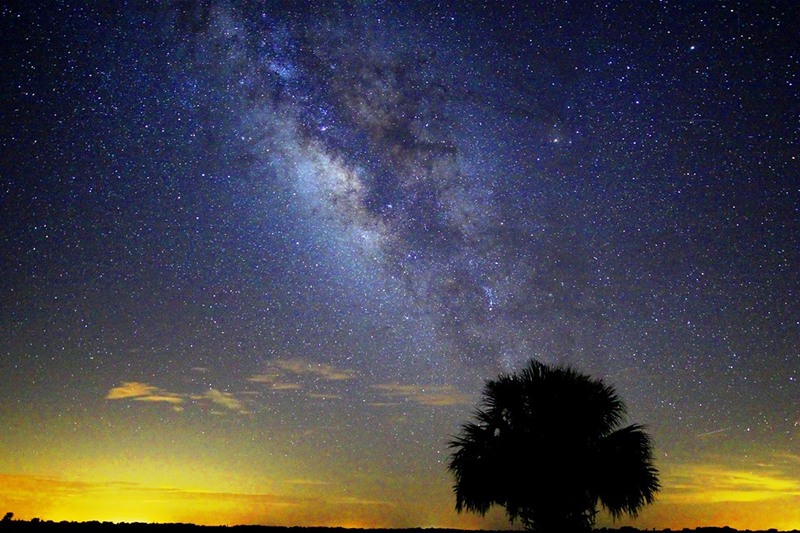 The galactic center of the Milky Way will be visible in the southwestern sky from just before 8:00 PM until around 9:20 each night. That said, you can still capture the Milky Way without the galactic center any time after that. 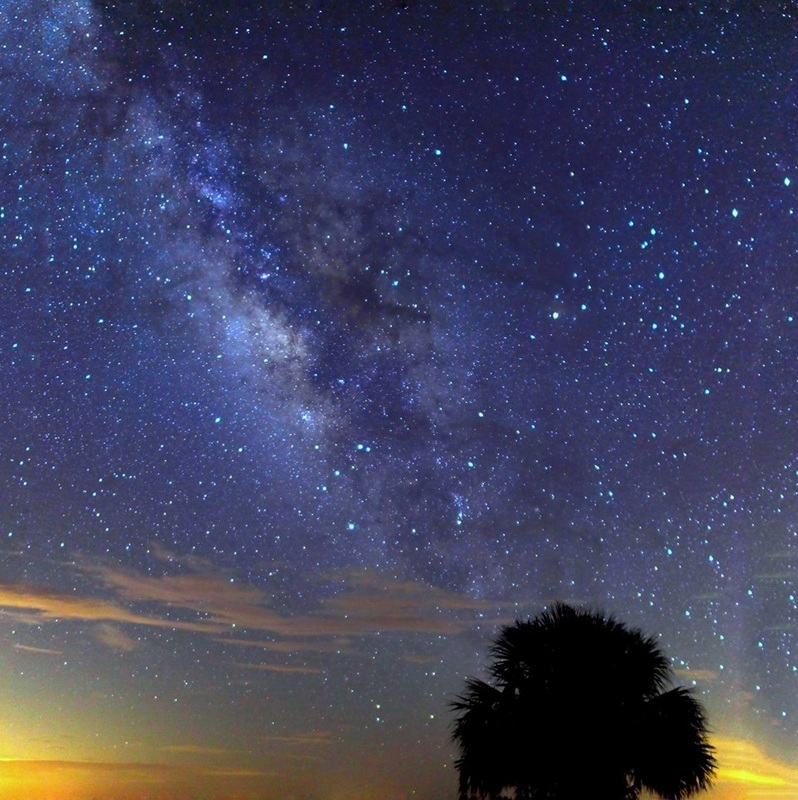 You will want to find a sky that is not contaminated by light pollution. From Waterbury, I think a good choice of location would be at the Appalachian Gap. Take Highway 17 from Waitsfield. It is only about a 10 minute drive from there and Waitsfield is only a 10 minute ride from Waterbury. There is a nice parking area on the right side at the summit. From there you can get a clear view of the southwestern sky. I hope you have clear skies and good weather for your shoot. Please post a sample of your results here. autzig - Thanks the article looks very detailed, i will go through it now.. Thanks for letting us know weekend looks good .. Can i ask is it safe and good idea to stop our car some were in dark for photos? We would be a driving in that area for first time so would like to check.. Are there any areas/spots that most photographers visit near by? I don't think there are a lot of photographers who shoot the night sky. I'm not from Vermont so I'm limited in my ability to suggest places to shoot at night. I think it will be perfectly safe if you shoot at the Appalachian Gap. There is a parking area there so you are way off the road. You will have some nice mountains to use as your foreground. It would be a good idea to find it during the day so it will be easier to find at night. Another possibility for a shooting location is the Trapp Family Lodge near Stowe, Vermont. I think it would be a good shooting location but I don't know about the ambient light you might encounter there. There are some open places away from the lodge, so you shouldn't have too much of a light problem. My first choice for shooting the Milky Way would be the summit of the Appalachian Gap. autzig - you got it! !